Across America, in the 1930s, still life gained in popularity over landscape. “Henry Lee McFee was America’s foremost proponent of Formalist Realism on the East Coast between 1923 and 1936. Formalist Realist artists wanted to paint realistically but shared a modernist interest in the formal rules of art. …” [i.e. balance, eye direction, color, texture, etc. ], and so restricted their modernist impulses to arranging representational objects. McFee’s favorite format was a Cezanne-like tabletop arrangement. (from California Art: 450 Years, p. 286.) The artist spent his last years teaching figure and still life painting at Scripps College in Claremont, California. The Skull, featuring objects from the desert, obviously was painted after his move west. Although McFee is still interested in the formal arrangement of realistic objects, they are no longer the pretty vases and living flowers he depicted in the East. The bleached cow’s skull, the dried leaves, the dead desert weeds, the rough cloth, all reflect McFee’s adopted interest in things Southwestern as well as a Depression-era appreciation for the beauty of natural and commonplace objects. McFee had never evinced interest in iconography (the symbolic significance of objects), but some art historians have suggested such subject matter, which he adopted in the 1940s, reflects his early 1940s brush with death from colon cancer. Though the composition appears casual, folds in drapery, the alignment of twigs, and the insertion of color are all meant to control eye movement. The objects seem to be arranged in an “X” with one diagonal leading from the lower left corner of the table, up the skull, where it is stopped by the bunch of dried leaves and the other leading from the upper left down the dried stems of the weeds, across the skull to the highlighted drapery. The emphasis on browns and blacks is not only natural to the objects but reflects colors popular with artists in the Depression. Provenance: deaccessioned from The Metropolitan Museum of Art, no. 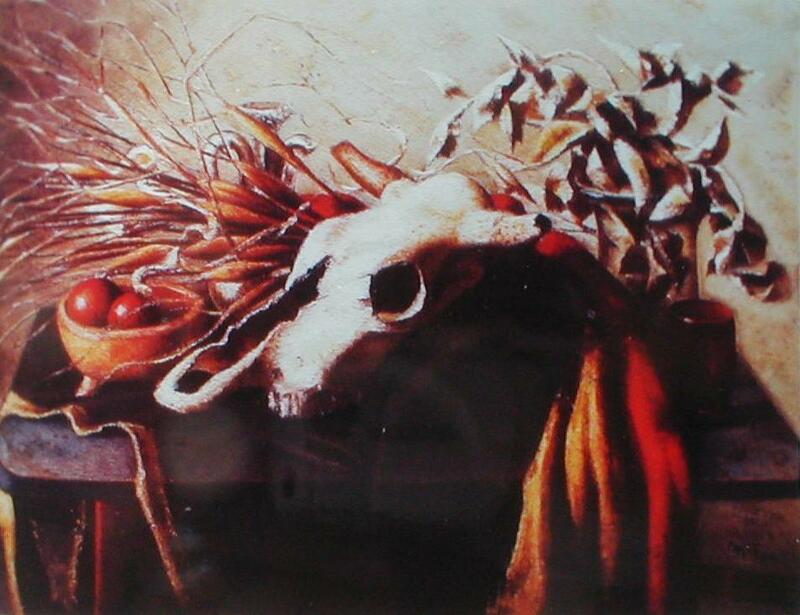 50.34.1 titled The Skull; purchased: Butterfield & Butterfield, Los Angeles, December 10, 1997, lot 3377; exhibited in a show of still life organized by the Orange County Museum of Art at the South Coast Center; Laguna Art Museum.